Visit a temple, an herbal shop, art galleries, antique stores, and more when guided to the unique treasures–not to mention great bargains–to be found in Chinatown. RSVP required as group size is limited. Submit a request online or call (213) 680-0243. Visit a temple, an herbal shop, art galleries, antique stores, and more when guided to the unique treasures–not to mention great bargains–to be found in Chinatown. The 2 1/2 -hour walking tour will be offered on the first Saturday of every month and will take visitors to a number of off-the-beaten-track points of interest, and will guide those interested in shopping to some of Chinatown’s best bargains and its trendiest shops. 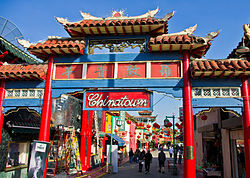 See why Chinatown is touted by Sunset and Los Angeles magazines as one of the hottest destinations for urban adventurers! Wear comfortable walking shoes and be prepared to wind your way through a myriad of alleyways, plaza stalls, and classical courtyards to discover the charm of L.A.’s Chinatown.